Cawnpore Lookout and the Lilleyvale Hills did not always stand so proudly on the horizon, and nor where the surrounding hues so brilliant and warm. Before this arid, dramatic landscape you see today, another world existed here. 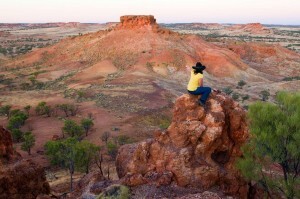 Approximately 90 – 95 million years ago rivers and lakes abundant with wildlife filled inland Australia. Fossil birds, platypus, frogs and snakes lived here. Weathering of the landscape created erosion, the more resistant rocks were left behind creating steep escarpments. The collision of the Australian Plate with the southwestern part of the Pacific Plate created the New Guinea highlands. This is believed to have caused a ‘rain shadow’ effect which drastically changed weather patterns in Australia, and dried out the landscape to what we see today. How can I experience this amazing landscape? 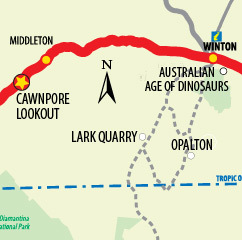 Located on the top of a glorious mesa and overlooking the Winton region is the incredible Australian Age of Dinosaurs Museum. The fantastic collection of fossils offer an incredible link to the region’s prehistoric past. Amidst this stunning landscape of red plains and jumpups, discover the trackways of the world’s only recorded dinosaur stampede. These prints have remained frozen in time for about 95 million years. 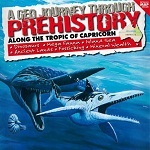 Visit the Australian Age of Dinosaurs website (Phone: 07 4657 0414). For more information about activities in Winton head to the Waltzing Matilda Centre (Phone: 1300 665 115).